A Syrian Arab Air Force (SyAAF) fighter jet was shot down while carrying out sorties over eastern Aleppo. Dec.3, a Syrian Arab Air Force (SyAAF) fighter jet was shot down while carrying out sorties over eastern Aleppo, reports claim. The Syrian Aero L-39 Albatros was conducting machine gun raids on Islamist insurgents in support of nearby Syrian infantry advances. The plane crashed overnight, at around 1:00 AM local time, in a rebel-held urban area between Aleppo Citadel and the National Eye Hospital. The two pilots were not able to eject before impact, initial reports suggest. Local opposition sources claim the jet was not downed due to technical failure but rather as a result of insurgent anti-aircraft gunfire. The Czech build L-39 Albatros trainer is mainly used for pilot training, but it has the ability to ground attack also. 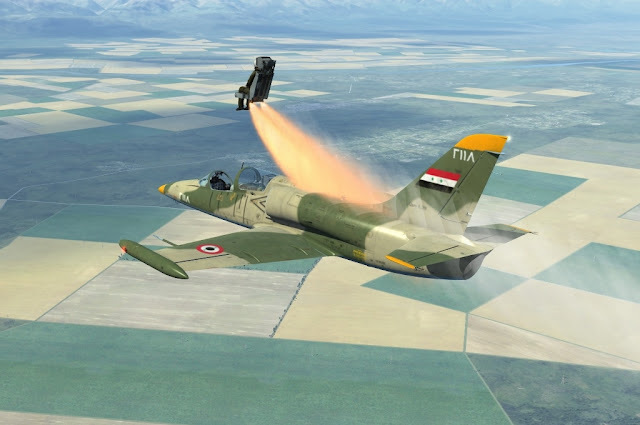 In the initial phases of the Syrian Civil War in mid-late 2012, these were the first fixed wing aircraft to be used against the various rebel factions, with a number of planes being lost in combat. More were captured or destroyed when Abu Al Duhur Airbase was overrun by the Al Nusra Front in February 2013. Al Nusra has made no known attempts to return these planes to flying condition, however. In fact, none of the original training bases for L-39 jets is still in government hands, though L-39s are still active flying from other bases. The L-39 is normally unarmed but can carry unguided bombs or rockets.